If you are purchasing a new property or having problems with your septic tank, it’s important to enlist a professional septic tank inspection service. Nobody wants to poke their nose inside a septic tank to find out what’s happening. Or even worse, climb inside to have a closer look. Our team will empty your tank and carry out a thorough drainage survey of pipes that lead to and from your tank. We will also check the structure of your tank for possible damage that may include cracks or root ingress. We use sophisticated cameras and other innovative tools to do this. Why enlist our septic tank inspection service? When preparing to purchase a new property, many people focus on its appearance without considering the status of the systems that they can’t see. However, this mistake costs buyers a lot of money especially when the property has septic problems. Our septic inspection service is, therefore, a perfect solution for property buyers. Our team checks the entire septic system to ensure that it’s in good condition and functioning properly. This gives you peace of mind when buying a property. When adding or remodeling your home, or moving into a mobile home, it’s important to have your current septic system inspected. This ensures that the septic system is in proper condition and that its size can accommodate the changes. Some septic system problems are easy to notice while others are not. For instance, grass that grows over your septic tank might be greener. Your toilets may be flushing slowly and sinks producing a gurgling sound. These are some of the signs of a problem with the septic system. When you notice these signs, including a foul smell coming out of your drainage system, it’s important that you hire our septic tank inspection service. Neglecting a septic tank can have serious consequences. So, why take the risk when Hemley’s Septic Service provides professional and affordable septic inspections that pinpoint possible issues before they become full-blown problems? Our team provides a detailed and thorough inspection regardless of the type, condition, or location of the tank. We also answer any question that you may have regarding your tank. Therefore, avoid a disaster and ensure your peace of mind by enlisting our septic system inspection service today. It’s important to note that septic tank pumping is not the same as inspection. However, you should have your tank pumped out before an inspection. That’s because when your tank is full, it’s impossible to carry out a thorough inspection. But, don’t worry because Hemley’s Septic Service can arrange all this for you. Once you enlist our service, our team will carefully check your tank using innovative tools to ensure that it’s structurally sound with no cracks or holes. We also check the tank to ensure that its lid fits properly and that its bottom is in good condition. We use innovative equipment to ensure that the baffles and dip pipes are also in good condition. Based on the inspection type that you choose, our team will check our drain field to ensure that it’s working properly. We will also determine its depth and square footage. If after the inspection our team establishes that your system needs repair, we will discuss your options with you. If you opt to have the tank repaired, we can help you with the permitting process and give you a quote for the repairs. 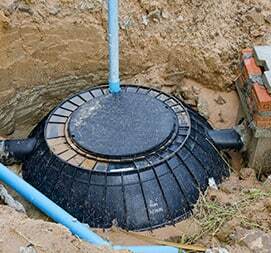 Why is a septic tank inspection service so important? 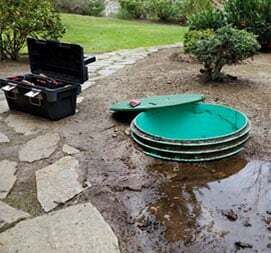 According to the Environmental Protection Agency, septic tanks should be inspected after every 3 years and pumped after every 3 to 5 years. That’s the only way to ensure that a septic system functions correctly and lasts longer. A professional inspection alerts you when a tank needs minor repairs, thereby preventing them from becoming major crises. Ignoring EPA recommendations can lead to an irreversible damage that will ruin the quality of groundwater and even cost you a lot of money in repairs. 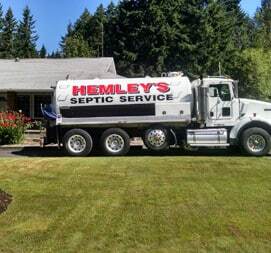 Hemley’s Septic Service ensures that the septic system of your property is properly taken care of to ensure that you are not stuck with expensive repairs in the future. Not everybody can inspect your septic system and provide accurate results. That’s why you should work with the right professionals only. Basically, a septic inspector is not the same as a home inspector. Our septic tank inspectors are professionally trained specialists that understand how a septic system works. They also know problems that are associated with this system and how to solve or prevent them. 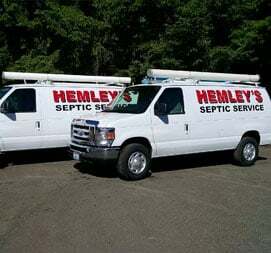 Hemley’s Septic Service has qualified inspectors that have been providing septic inspection services for years. We are a certified and insured septic company that adheres to the highest service quality standards. We have also invested in modern septic inspection equipment to ensure that every job is done thoroughly, accurately, and efficiently. Our septic tank inspectors are highly friendly, reliable, and professional. Scheduling your tank inspection with us is very easy and convenient. That’s because we have customer care representatives that are always ready to respond to your calls and emails. So, why run the risk of allowing septic tank issues to escalate into serious crises. Give us a call now to hire the best septic tank inspection service!